Sometimes, tracking down the true story of a particular car or driver from the past can be so close to impossible that it takes forty years [and a little coincidental luck] to unwrap the mystery. One such case rested with a nondescript maroon #19 coupe that happened to appear, unceremoniously, at Fairmont Speedway in 1963. The car arrived, one lat4 summer Sunday afternoon, in the body of an old Ford dump truck. Nothing much was said of the car during pre-race practice; although I was always fascinated and attentive to newcomers. The sometimes distorted public address system boomed out the lineup of the heat in which the new car was seated. It was said to be driven by Tom Bennett, from #$@@! ** Bay. I couldn’t make out what the first part of the address was through the feedback; so, I concluded it must have been Malletts Bay [as I had been to one race there in 1958 and it was the only racing bay I could think of]. When the mysterious 19 took to the track for a heat race, in front of John Quenneville’s Checkmate, not much was known about it. I assumed, from that day forward, that it was a Malletts Bay Speedway car that was making a forbidden pilgrimage South, hoping that the NASCAR Nazis wouldn’t find out. As the years [and decades] went by, nothing more was seen or heard of the maroon Ford coupe. When I began serious race history research in 2005, no one seemed to know anything about that car – at any of the many Colchester tracks on the 1950’s. The prevailing red #19 of that era was that of Rex Shattuck, with a coupe that may have been a partnership with Norm Cyr. I had seen Shattuck and that particular car at the Otter Speedway track in 1961, not surprising because both Malletts Bay and Otter Creek were sanctioned by NASCAR. The mysterious 19 remained just that – for over forty years. 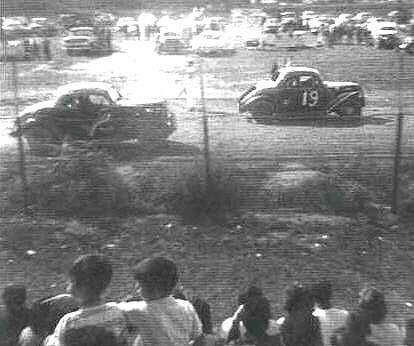 Then, in late ’05, my friend and fellow history buff Len West sent me four photos from the 1962 season at Fairmont Speedway. There was that car again ! Coincidentally, West must have taken his camera to that the track on the very week the the Tom Bennett car made its only visit to Fairmont. A lucky stroke for those of us who love the obscure. But it still didn’t explain anything.. Armed with now two photos, I continued to try and talk the old hands from the mallets Bay days into the fact that this car ran there. Nobody was buying it. We considered all the tracks in the township of Colchester: Smitty’s, out on Route 2A, the Sunset Speedway, the mysterious Green Mountain track overlooking the lake; Brigante’s three fifths mile out on Williams Road, and the principal track – Barcomb’s Bayview Speedway. Still no leads. One Saturday night, during this past summer, I found myself at Mike Perrotte’s Airborne Speedway over in Plattsburg, New York. Trying to find out more about the old Ashland Park track in Warrensburg, I was visiting the hauler of modified driver Terry Hayes. As luck would have it, I was referred to Bruce Keith, a man seeming too young to know anything about any track from the era of which I was inquiring. Keith’s mother, as it turns out, was not only a scorer at Warrensburg, but an avid historian as well. Although Mrs. Keith had recently passed away, Bruce had learned a lot from his mother. Meanwhile, Bruce had motioned to another man sitting quietly nearby on one of Hayes’ racing slick inside the hauler with us. The large, crew-cut man turned out to be former driver “Rapid Ralph” Palmer, from Glens Falls. Between the two, the truth about the maroon #19 inadvertantly tumbled out. The car turned out to be not a Malletts Bay, but a Warrensburg regular. It was the Red Lamphere – owned car, which ran out of Lake George, New York; and it most likely was also a regular at Whites Beach, the Ballston Spa track that seemed linked to Warrensburg. Bruce Keith points out that Warrensburg and Whites Beach often shared scorekeepers, officials, and even promoters – as well as many competitors. When both tracks had bitten the dust by 1961, one of the benefactors was C.J. Richards’ newly – re-opening Fairmont Speedway. Although orphaned from his other tracks, apparently Bennett and Lamphere did not find the Fair Haven half mile oval to their liking, as we never saw them again. Another Fairmont mystery car that took a long time to sort out was a blue and gold 1934 Ford coupe that was trailered into Fairmont around 1964 to be driven [just once] by local legend Moran “Sonny” Rabideau, a man destined to be inducted into the NEAR Hall of Fame by the year 2003. I always figured the car was a Lebanon Valley runner, as it had that Valley look and it had equipment far superior to the Fairmont regulars. It couldn’t have been a Fonda car, as the track had outlawed the flat-topped pre-1936 coupes by then. The car had a professionally – done #43 on the sides and trunk, flanked by checkered flags. I don’t remember what Rabideau did that day or why he landed the ride; but, I am sure he didn’t win the feature. The potent #43 arrived mysteriously and left the same way. The people in the grandstands never learned much about it. Nothing was heard of the car at Fairmont, and years passed without the car ever being seen in our area again. It had occurred to me that the car was not only like Valley cars, but it was extremely similar to Ralph “Rufus” Chittenden’s #32, which ran at Fairmont semi-regularly [and very successfully]. I also assumed that Chittenden was a Lebanon Valley regular because of the car’s look. After seeing Chittenden featured on the Onteora Speedway Park page in the 1964 version of “The Cavalcade of Auto Racing”, I realized other tracks enjoyed regulars who might have run Lebanon Valley. I didn’t realize it, but it was here andat Mid State, in Morris, NY, that the car often ran. In 2004, I had begun sending photos to the vintage modified web site of Otto Graham, in New York. The photo of the blue and gold Ford immediately struck the attention of Graham and there ensued a flurry of attention to it from Otto, Rick Parry, Jeff Ackerman, and other area race historians. As it turned out, the car was a regular at Morris’s old fairgrounds track, and it was driven by Don Wayman, of Cobleskill. I noticed it was similar to several Morris cars, including the puke green bounty car of Gene Cole. gas station, sporting Don Wayman’s name. As it turned out, we had more photos of that 43, outside someone’s old ESSO station in mid New York somewhere. Prophetically, the sign on the station wished the old car “Happy Motoring”. Don Wayman, usually a Fonda regular who loved to drive the Wright/Zautner cars, was the car’s most customary chauffeur apparently. I never learned the owner’s name and it not clear what happened to the car, but there is little doubt that Rabdieau had driven Donny Wayman’s ride that one time. The third mystery Fairmont car was a 1939 Ford that made so few waves in its only visit to the track that I didn’t even have a clear idea of who had actually driven it. For 41 years, I could only recall the car’s sky blue and white color scheme, and I had been given the mistaken impression that it was driven that day by Butch Jelley, a Valley regular who had not yet begun his legendary stint with the Martin Riiska yellow X cars. The car had come to Fair Haven, sporting the number 39 [probably for its date of manufacture]. Clearly, the vehicle had been carefully prepared – at least at the outset – because it obviously had been painted professionally and the graphics were also done by a commercial sign painter. The #39 was thought to be run by Jelley, even though no one could fathom where it had come from or how he would have come into that job. There was an ambiguous reference to the “U.S. Air Force” on the side; and, I assumed that might have explained the sky blue color of the body. But, in those days, branches of the service certainly did not sponsor weekly bullring cars. The car did not appear to run smoothly, and it did not enjoy much success that say. The pretty blue Ford ended up being run by Jim Langenback, from Schenectady. Thank God I never threw anything away. As with the other two mystery cars, the years came and went, and no one knew anything about the #39. Finally, this past September, I happened to luck into finding an old printed sheet that served as an insert to one of C.J. Richards’ C.V.R.A. race programs from an early 1960’s Fairmont show. On the sheet, was a drivers’ roster, which included the names of several drivers whom I had long forgotten. One of the long-forgotten entries on the mimeographed Fairmont entry sheet was #39, Jim Langenback, of Schenectady. I had remembered "Ed Zackenback" – but with an older – bodied # Z1 as an infrequent Fairmont visitor from the Capital District. His cutdown Z1 hadn’t exactly cut a swath through the Fairmont competition. But, after helpful info from Russ Blake, I now know it is the familiar Valley runner, Langenback. So, most likely, it was Jim L whose car I had photographed, not Jelley. If Butch had anything to do with the car, he would have had to be a last – minute relief driver. No matter who drove it, the Air Force car drove more like a World War II tank. As I wrap this most recent column up, I want to end with recognizing my friends, the Davis boys and Neal’s father-in-law, Al. They joined me to walk the grounds of the old Otter Creek Speedway/Hillside Raceway/Rainbow Ridge Speedway site in the town of Waltham, near Vergennes, Vermont. 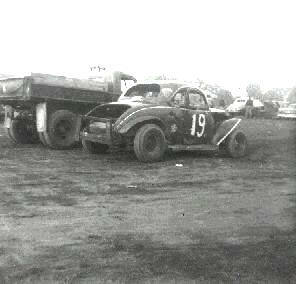 The Davis boys’ father, Carroll “Crash” Davis, had run briefly at the old Pico Raceway in Rutland, Vermont. Neal, in particular, is a devoted student of racing history. He and brother, Rob, are familiar figures at the Swanzey, New Hampshire vintage stock car shows, displaying their numerous models of old stock cars. The Davises and I trudged, wet-footed, through the rain and sleet – soaked pastures in Waltham, to find several remnants of the short-lived but dearly – loved Vermont track. Thanks guys. Neal Davis pulls out what could be a part from one of the last cars to run at Rainbow Ridge. We had found other part, including a “cow catcher” bumper off the front of a modified.